At the confluence of the Qingyi. Dadu, and Minjiang rivers, Leshan and Meishan cities are found in the southwest of the Sichuan Basin. Leshan enjoys fame as the "Fragrant Kingdom of Crabapples" due to the abundance of flowering Chinese crabapples. Its long history and culture have combined with unique natural beauty to make Leshan a famous scenic spot. Among its wellknown attractions are the world's largest statue of the Buddha, Mount Emei, the ancient temple at Wuyou, and the Thousand-Buddha Cliff. Sites under the jurisdiction of Meishan include the Sansu Shrine and Mount Wawu. Standing at the toot of Mount Lingyun to the east of Leshan, the incredible Leshan Buddha is the largest .lone image of the Buddha in the world. Work on the masterpiece of religious sculpting hegan in 713, the I irst year of the reign of the Tang Emperor Kaiyuan, and lasted more than 90 years. Located in the southwestern corner of Meishan county, at the center of a 160-km corridor between Chengdu and Leshan,the Sansu Shrine was the former residence of Su Xun, So Shi, and Su Zhe, famous writers from the Northern Song Dynasty (960-1127). Mount Emei is within the boundaries of Emeishan City, some 140 kilometers to the southwest of Chengdu and 33 kilometers to the east of Leshan. The mountain has four peaks, known as the Great E, 2nd E, 3rd E, and 4th E. The peaks rise one higher than the next to unfold into a vast and verdant scene, giving rise to the claim that "Emei's beauty is the finest under heaven." One of four famous Buddhist mountains in China, Emei includes several attractions, such as Baoguo Temple, Fuhu Temple, Leiyin Temple, Chunyang Palace, Da'e Temple, the Qingyin Pavilion, Hongchun Plain, Xian's Temple, Xixiang Pool, Golden Roof, Ten-Thousand-Year Temple, and White Dragon Cavern. 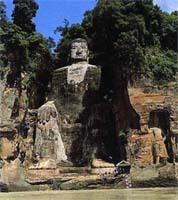 In 1997, Mount Emei and the Leshan Grand Buddha were added to UNESCO's list of World Natural and Cultural Heritage. Located to the southwest of Hongya County and more than 50 kilometers from Mount Emei, Mount Wawu (Tiled House Mountain)has rivaled Mt. Emei in tame throughout the ages. Named for its flat summit, which resembles the tile roofed houses of ancient China, the mountain covers an area of more than 10 square kilometers. The summit is blanketed in primitive firs and dragon spruces. Several waterfalls can be found at Mount Wawu. Among these, the Lanxi cataract drops 1,040 meters and is the most famous. Dove trees and azaleas spread along the mountain crest, providing a spectacular backdrop to mountain views. The mountain is snow-capped during for about five months, giving the mountain a decidedly northern appearance.